In order to satisfy repeated requests by correspondents, a medium power audio amplifier incorporating tone controls in the feedback path was finally designed. To avoid an excessive increase in parts-count, due to the addition of the tone controls, a simple amplifier circuitry was designed on the same guidelines of the successful 45 Watt Class B Amplifier, but using the excellent NE5534 IC instead of a discrete component op-amp to drive the output "dumper" transistors. The particular circuit configuration, allowed to push the NE5534 exceptional capacity of driving the output transistors near to its limits, enabling the whole amplifier to deliver relatively high power outputs without problems. For this reason, it was possible to obtain 18W into an 8 Ohm load using a power supply voltage of +/- 20V. Despite the complication added by the tone controls, the amplifier has an input sensitivity of 130mV RMS, allowing to connect directly to its input the most disparate audio sources without the need for a separate preamplifier. 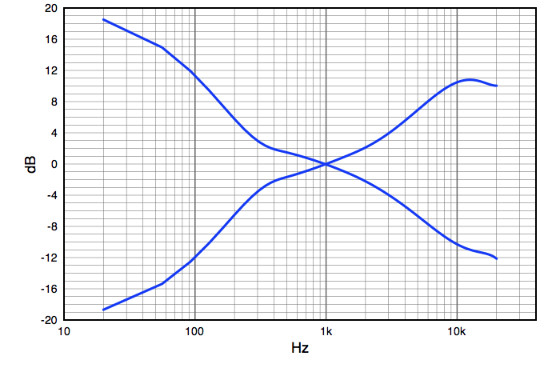 Total Harmonic Distortion figures are astonishingly low, much lower than comparable audio amplifiers using a single-IC audio amp. 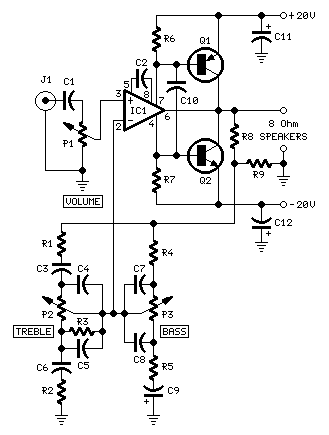 An interesting feature of this amplifier is the absence of any kind of setup. The power supply is straightforward. The parts values suggested are suited to power a stereo version of this design. For a mono amplifier a less powerful mains transformer can be used, having a 30V Center-tapped or 15 + 15V secondary winding, rated at about 24 to 30VA or 0.8-1A. Q1 and Q2 power transistors should be mounted on a finned heatsink of at least 100x50x25mm. + and - 22V is the absolute maximum permissible voltage supply for NE5534: please do not exceed this limit. In the event you obtain a higher voltage from your power supply, you can consider the use of a regulated supply. Please see Simple, Efficient, Regulated Power Supply.